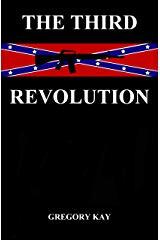 THE THIRD REVOLUTION is the first installment in a four book series chronicling a second War for Southern Independence, from its inception in Columbia, South Carolina, to its international aftermath. The series takes a hard, pragmatic look at often uncomfortable subjects like war and race, love and loyalty, and the best and the worst of human nature, and pulls no punches. Needless to say, it is not politically correct. The series order is THE THIRD REVOLUTION, THE LONG KNIVES, THE BLACK FLAG, and THE WARLORD; all are available on Amazon in both soft cover and Kindle format, along with other books of various genres by the author, Gregory Kay. It's the 21st century, and the South is rising again! When a peaceful demonstration over a Confederate Battle Flag goes horribly wrong, two strangers - police officer Frank Gore and reporter Samantha Norris - find themselves running for their lives. Labeled "terrorists" an pursued by covert government death squads through a South torn by depression, racial tensions, and martial law, their only chance for survival lies with a bitterly divided band of Rebel guerrillas. Faced with a conflict that threatens to split both the Union and the races irrevocably, and the dawning realization that there are no good guys in war, only survivors, they begin to wonder if it's really much of a chance at all. How far would you go to survive THE THIRD REVOLUTION? For Nationalist and especially Southern Nationalist perspectives, editorials and news regarding the ongoing war for White identity and cultural survival, visit Occidental Dissent. Visit louisianarebel.com or see them on their Facebook page at Chandler's USA & Confederate Store.